Whenever I go to my parents who live near the provincial town of Winterswijk I visit the local second hand shops. Sure there is not as much choice as there is in Amsterdam, but things are often quite cheap. I've been coming to my favorite antiques store for years and the owner knows me by now. I always get a cup of coffee when I'm there and we have a nice chat and I get shown any particularly interesting thing he has in the store or somewhere in the back. The magnificent art deco electric heater in my living room also came from that store. Most of the time I buy small things, like jewellery. I only rarely find clothes. In my teenage years I once bought several 1920's chemises, made from soft but sturdy cotton. They were still packaged and had belonged to a woman's trousseau but were never used. I wear these as nightgowns, they are of such good quality they've already lasted for about 10 years. On my last visit I saw something draped over a chair probably put there to support the musical instrument resting on it. But it cought my eye because it looked handmade. 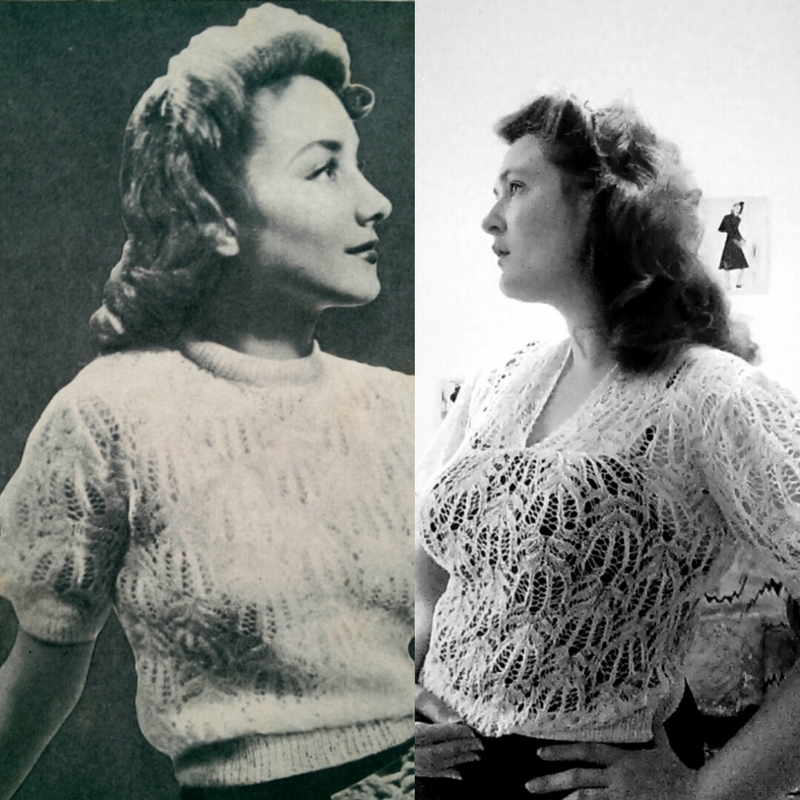 And indeed it was a hand-knit blouse from the 1930's. 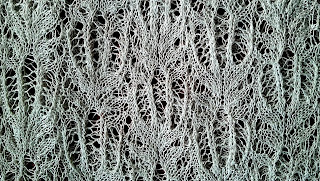 It was a delicate ajour motif that mimmics lace. I did not even try it on and bought it right away as it was so cheap. It turned out to fit just right. So glad to have found it. I rarely find knitwear in a good state. And this is so finely worked it could easily have torn. 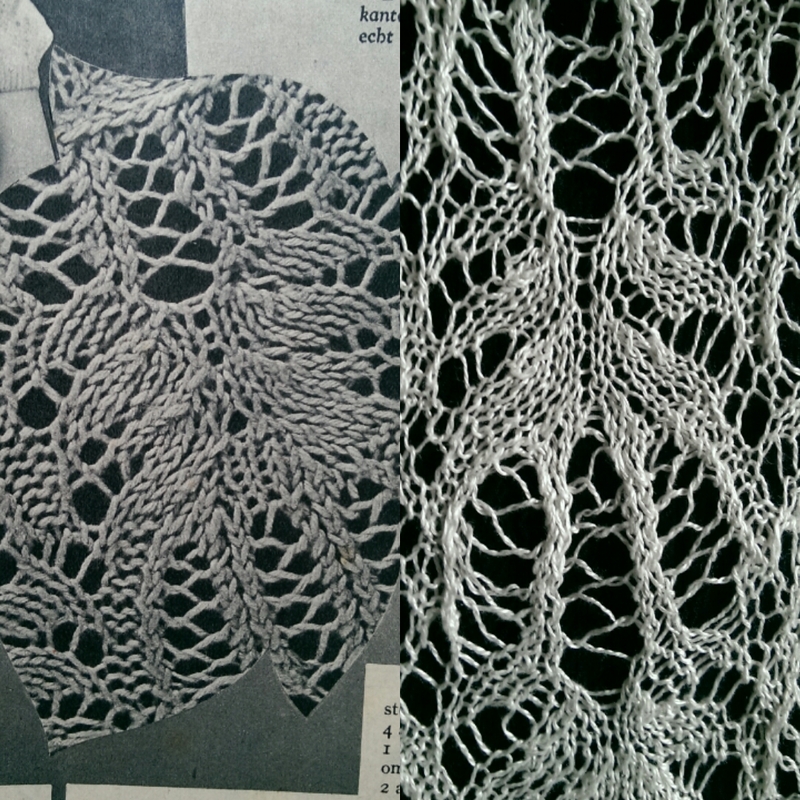 The funny thing was that the pattern reminded me of a pattern from a magazine my mother once started on. 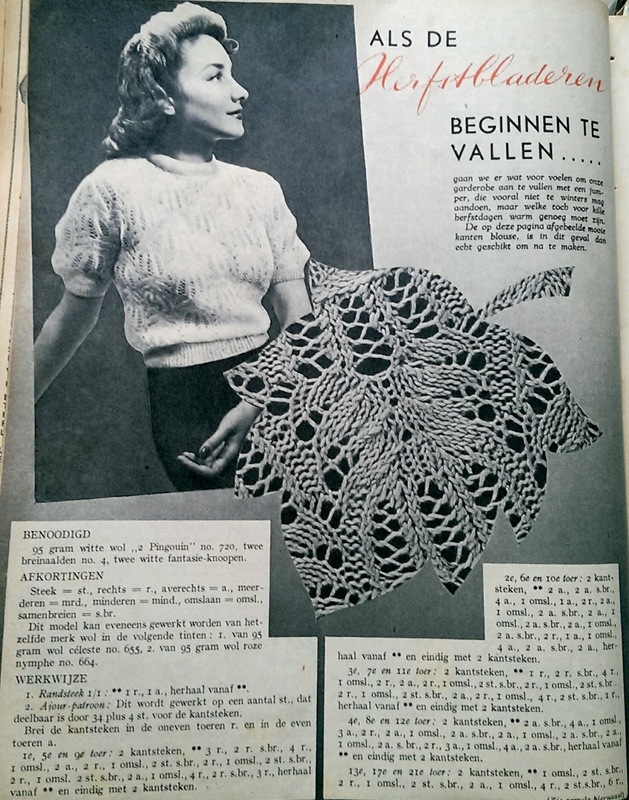 I had asked her if she could knit it for me but after a little trial and error she found that she could do it but that it was not relaxing enough so the project was abandoned.The magazine was the autumn edition of 'Het Rijk der Vrouw' from 1939. Of course I looked up te pattern. It really matches the blouse and not only the ajour motif, the sleeves and the border do as well. 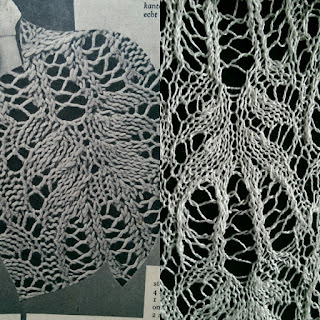 On the left is a close up of the pattern in the magazine on the right the blouse I found. 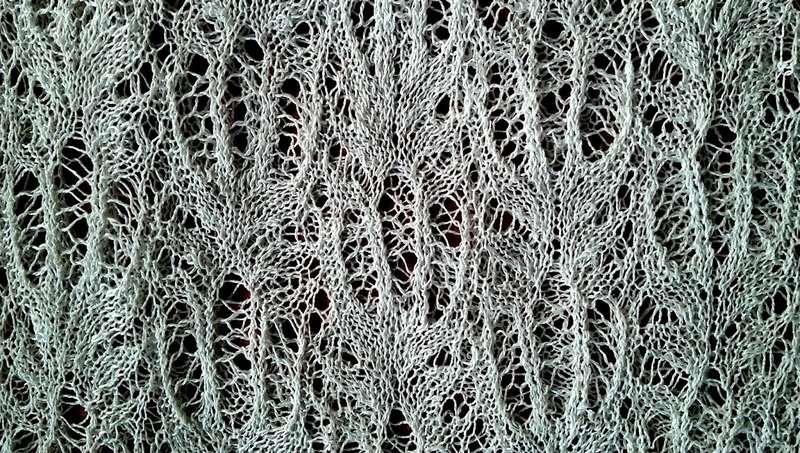 The yarn is less thick and made of cotton instead of wool, but the motif is an exact match. The only thing that really differs is the neckline. It does make me wonder....Might it be made from the same pattern that was atlered a little.The pattern does mention a split at the back to be closed with a few buttons. Could it be, should it be worn the other way around with buttons? Though it seems a possibility it looks odd the other way around. Or is the ajour motif so general it was used for many patterns? So if anyone has any idea? 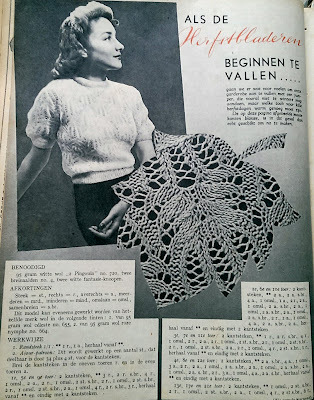 As a knitter I can only see that the blouse was very probably knitted after precisely that pattern ; the model, the stitches and even the stitchcount is exactly the same. 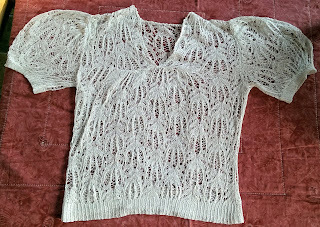 Only the maker used thinner yarn - to make it more lacy or because that was at hand - and decided to give it a different (easier, but also "lighter" neckline, that fits the thinner yarn better and make it look more like a blouse then a sweater. 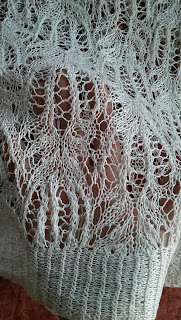 It is a rather easy alteration for a skilled knitter, and for this project you NEED to be a very skilled knitter. 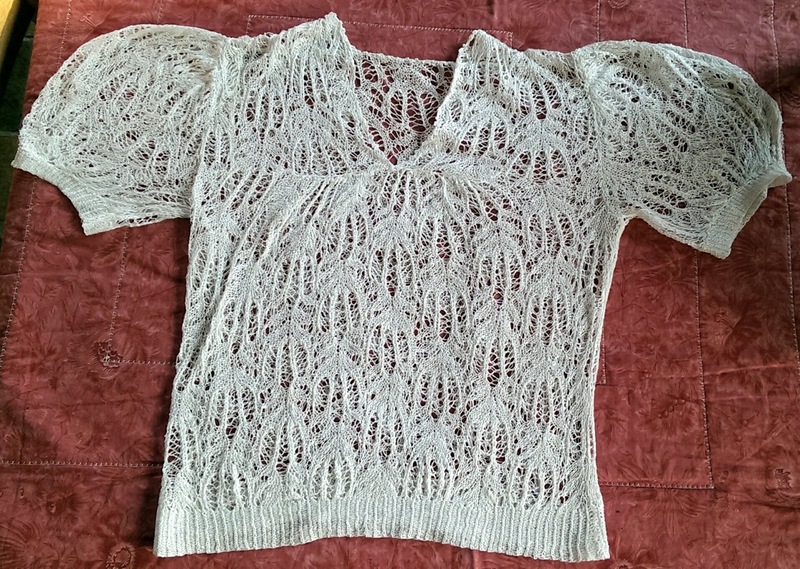 The ajour pattern, although I do not know it's name, is defnitely a 'classic', because it took me little effort to find a contemprary sweater in the same stitch : http://www.ravelry.com/patterns/library/sophie-top (it is upside down, but this top was knitted from the neck down) . If the quality is really good, there is, however, no guarantee that your blouse was knit decades ago ; many old patterns were used all through the past century, but it can definitely pass as an original. It looks great on you. Wear it with joy. What a fantastic find ! Thank you so much for your response, really helpful!! I will certainly wear my blouse with a lot of joy! So interesting to see modern patterns that use the same motif! It must have been a lot of work to make that little blouse of mine. My mother is quite a good knitter. She tried the pattern (also in thinner cotton yarn like the blouse) from '39 years ago and though she could master it she had to think to much to relax while knitting. And yes always a problem with dating knitwear. 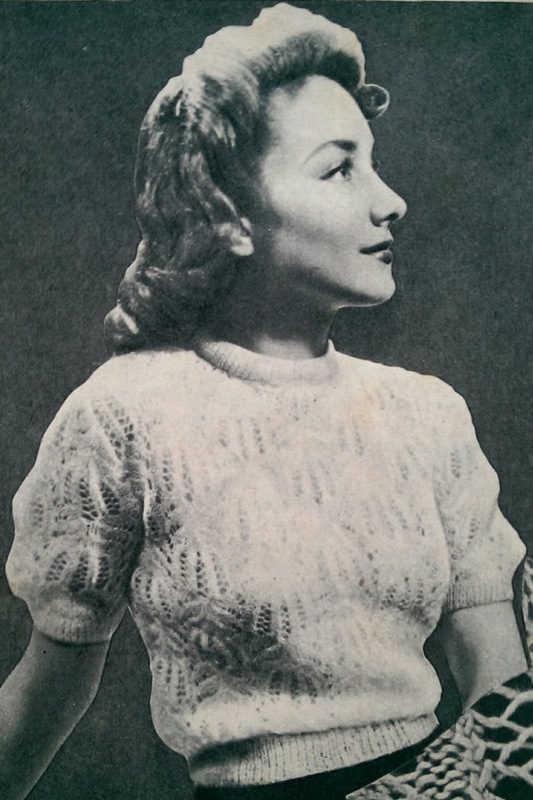 The cardigans my mum knit me from 30s patterns might also pass for originals ;). But I don't really care about that as they're made in the exact same way as 75 years ago :). Always makes me think I should learn how to knit.